MB&F updates their collection with a special edition of the Horological Machine 8 by adding a moon phase. Not any moon phase, but one in collaboration with the eponymous Stephan Sarpaneva. Presenting the MB&F Moonmachine 2. 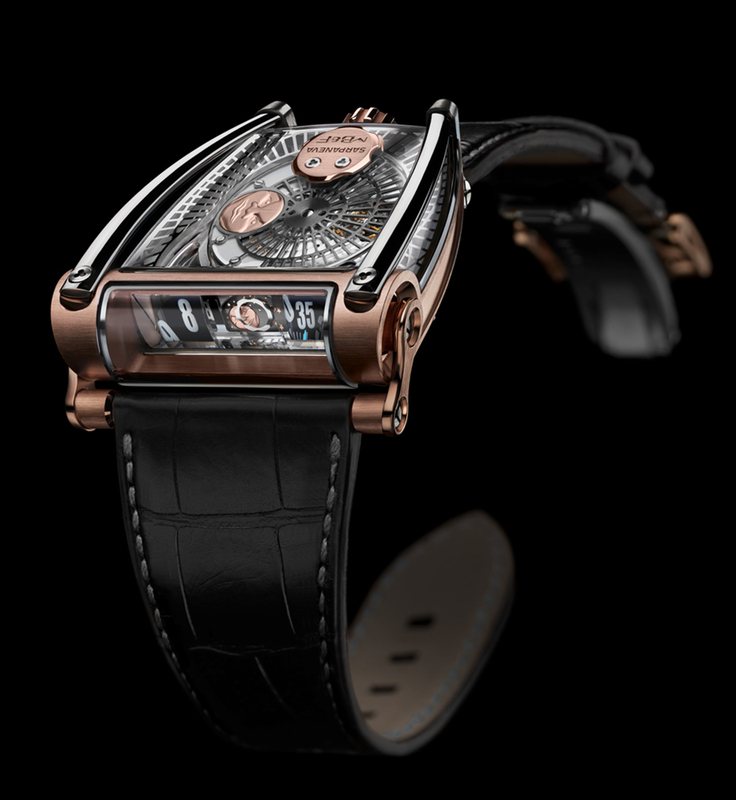 This is not the first time MB&F have collaborated with Stephan Sarpaneva. The first time resulted in a very successful addition to the HM3 family. For more information on first Moonmachine, also a collaboration between Sarpaneva and MB&F, click here. 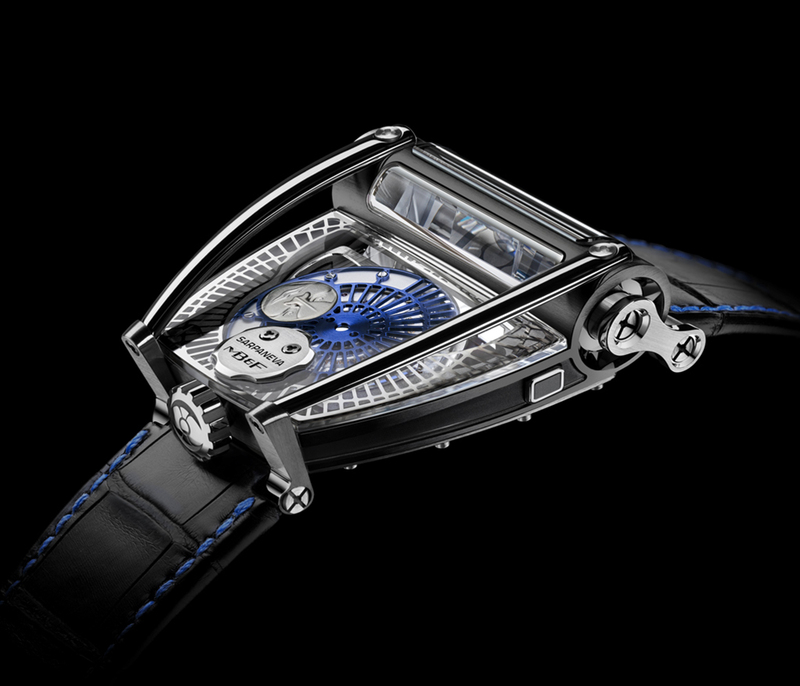 The Stephan Sarpaneva signature of the radial web on the rotor and the moon with his own facial features. In this latest escapade, MB&F now updates the HM8 with a moonphase, and calls the resulting watch, the Moonmachine 2. The watch plays on the principle of projection, just like moonlight does not really exist, as the moon does not give off any light of its own, but moonlight is actually sunlight reflected off the surface of the moon. 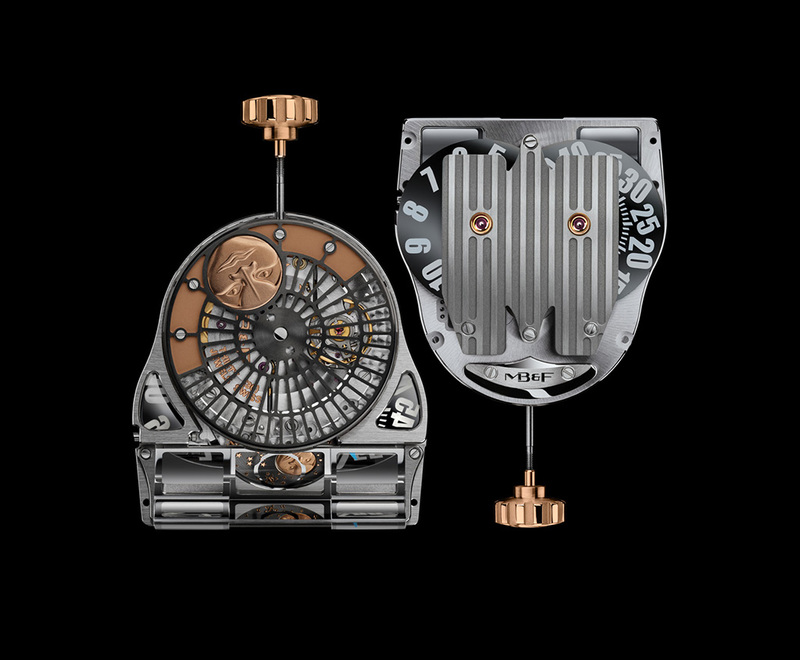 The moonphase display is projected via a prism mechanism installed on what is basically a stripped down version of the HM8. The optical prism, which refracts the hours, minutes and moon discs in their flat positions to appear as if they are perpendicular to the engine. The prism is cut to magnify the hours and minutes by 20 percent for greater readability. But the moonphase display is not magnified as there is a risk of distortion. The case of MoonMachine 2 is 0.5mm thicker than that of HM8, to accommodate the additional moon disc, and has a pusher on the side for quick adjustment of the moonphase display. 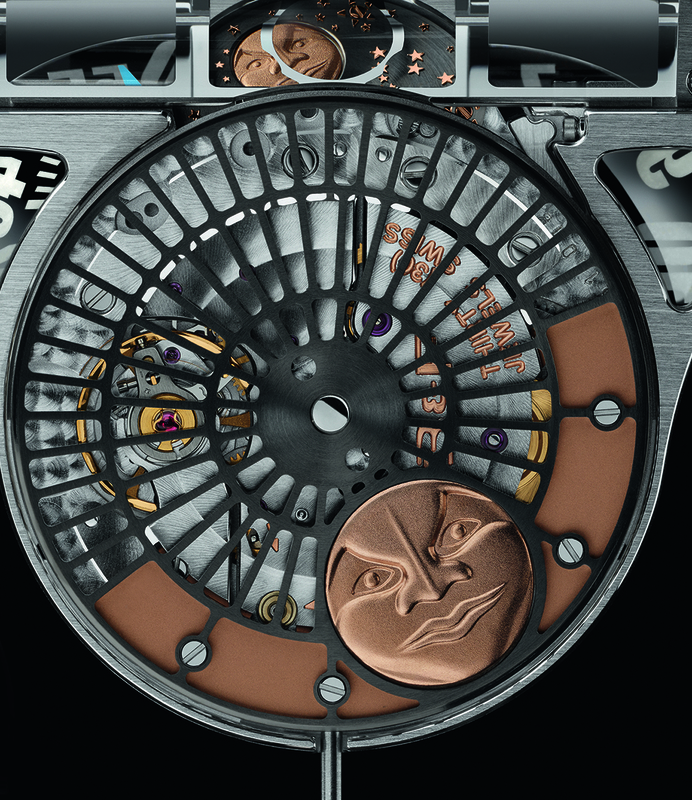 The rotor is easily identified as a Sarpaneva creation, with the open worked radial web and the signature Moon which is based on Stephan’s own face. Red gold and titanium case, red gold moon faces, anthracite sky. – Titanium version: Light Blue hand-stitched Black alligator strap with titanium folding buckle. 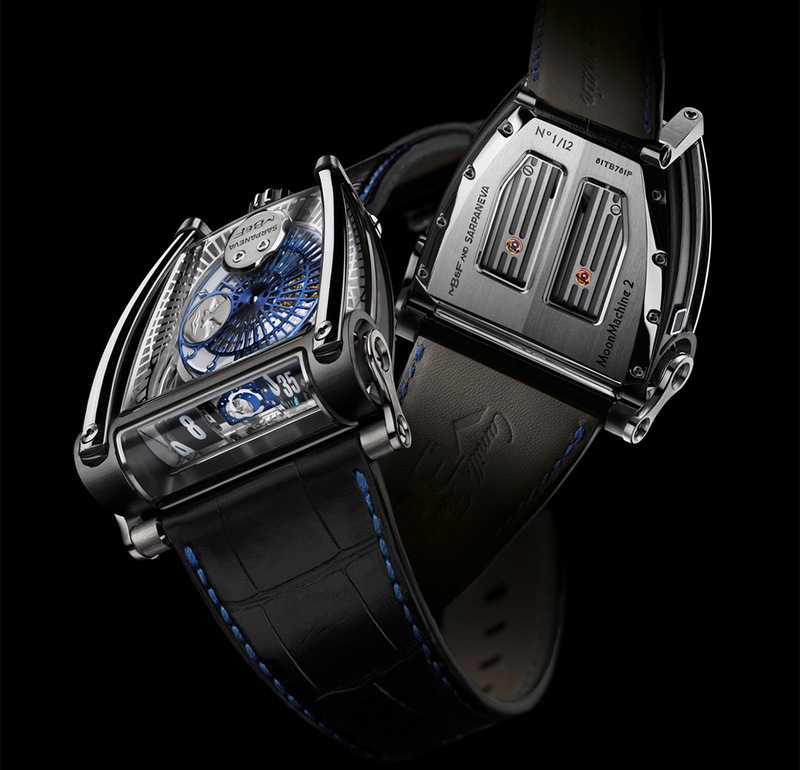 – Black Titanium version: Dark Blue hand-stitched Black alligator strap with titanium folding buckle. – Red Gold version: Grey hand-stitched Black alligator strap with red gold and titanium folding buckle.